A day after their jumpers topped the team podium for the first time in 60 years it was the turn of Carl Hester, Laura Bechtolsheimer and Charlotte Dujardin to bring spectators to their feet in celebration of the first-ever British Dressage medals in the history of the Games – and, even better, they were also golden ones. Dujardin went on to add the individual title and, four years later, the question is whether she and her wonderful gelding, Valegro, can do it again. 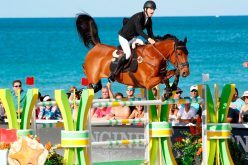 They arrived into the sport already on the crest of a wave of excitement created by the spell-binding Dutch partnership of Edward Gal and the fabulous black stallion, Totilas. 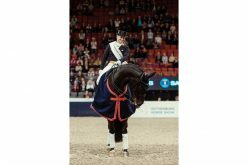 This pair set the world of Dressage on fire on an August night in 2009 in the shadow of Windsor Castle (GBR) when they won the European Freestyle title, and nothing has ever been the same since. 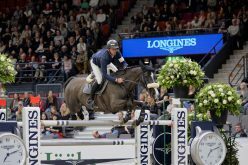 The previously relatively sedate sport suddenly realised the entertainment value of the discipline, and Dujardin and Valegro have picked up that flag and flown it high ever since, with a passionate fan-base following their every hoofprint! The pair now hold all three world records in Grand Prix, Grand Prix Special and Freestyle. 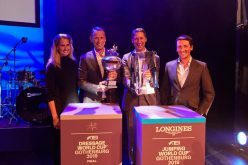 They took double-gold at the Alltech FEI World Equestrian Games™ 2014 in Normandy (FRA) and Grand Prix Special and Freestyle gold at the FEI European Dressage Championships in Aachen (GER) in 2015. They were also crowned champions of the Reem Acra FEI World Cup™ Dressage series in both 2014 and 2015. They have, quite simply, been all but unbeatable. 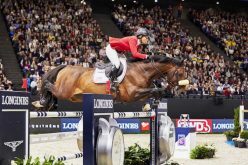 However their margin of victory in the Freestyle at Aachen last summer was a very narrow one, with just 0.25 percent separating the British pair from Germany’s Kristina Bröring-Sprehe and Desperados FRH who are expected to give their main rivals a run for their money again in Rio. Team Germany had to settle for bronze at the Europeans a year ago when the British took silver and the Dutch side of Diederik van Silfhout, Patrick van der Meer, Edward Gal and Hans Peter Minderhoud claimed the gold. But the Germans look super-strong for Rio 2016, where Bröring-Sprehe is joined by Sönke Rothenberger (Cosmo), Dorothee Schneider (Showtime FRH) and the inimitable Isabell Werth (Weihegold OLD). Werth is a long-time legend with eight Olympic medals already in her trophy cabinet, dating all the way back to the Barcelona Games in 1992 where she took team gold and individual silver with Gigolo. Werth has found another magical partnership in the 11-year-old mare Weihegold, and there’s a whole new energy around the 47-year-old athlete as she heads into her fifth Olympics. At the 2016 German Dressage Championships in Balve in June, Werth pinned her Rio team-mates Dorothee Schneider and world number one Bröring-Sprehe into silver and bronze with some spectacular results. 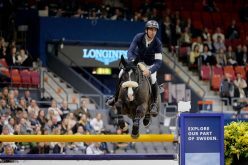 Carl Hester (Nip Tuck) joins Dujardin, Fiona Bigwood (Orthilia) and Spencer Wilton (Super Nova ll) in the British bid to defend that London 2012 title, while the Dutch send out Adelinde Cornelissen (Parzival), Edward Gal (Voice), Hans Peter Minderhoud (Johnson) and Diederik van Silfhout (Arlando),. But somehow this time around, Team Germany – the country with the most outstanding record in Olympic Dressage with 12 team and seven individual titles to their credit – look set to be the real force to be reckoned with. Dressage is about training the horse to a high level and highlighting its athleticism and the beauty of its movement. At its best, horse and rider work in complete harmony and together they appear to “dance”! The team medals will be decided after the Grand Prix Special on 12 August, which is also the second individual qualifier from which the top-18 (and those tied for 18th place) will go through to the Freestyle Final two days later. The Freestyle to Music is a stand-alone competition to decide the individual champion. Only three athletes from each nation are eligible compete in the Freestyle. A team is composed of three or four horse/rider combinations, with the best three results from the Grand Prix and the Grand Prix Special counting for the final team classification. 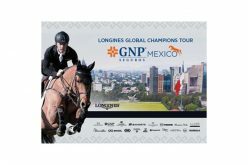 A computerized draw to decide the starting order in the Grand Prix will take place after the Horse Inspection on 8 August. Individual athletes will be drawn first, in reverse order of the World Dressage Ranking List, in two groups and with the highest-placed athletes drawn on the second day. Teams will be drawn in groups of five. The starting order for the Grand Prix Special will be drawn in groups during the Chefs d’Equipe meeting on the day after the Grand Prix. The starting order of the athletes within a team will remain the same as in the Grand Prix. (iv) 4th group: Athletes of the teams placed one to three (1-3) in the Grand Prix. The starting order of the Athletes within a team will remain the same as in the Grand Prix. The Dressage Tests are the FEI Grand Prix, the FEI Grand Prix Special and the FEI Grand Prix Freestyle. The British are team and individual defending champions. The British partnership of Charlotte Dujardin and Valegro won both team and individual gold at the London 2012 Olympic Games. They hold the world records in Grand Prix, Grand Prix Special and Freestyle. They took double-gold at the Alltech FEI World Equestrian Games™ 2014 in Normandy (FRA) and individual gold at the FEI European Dressage Championships in Aachen (GER) in 2015. They were also crowned champions of the Reem Acra FEI World Cup™ Dressage series in both 2014 and 2015. Germany’s Isabell Werth is another phenomenon of the sport and looks ready to set a new record at the Rio 2016 Olympic Games. She already has eight medals from Games dating back to Barcelona (ESP) in 1992 when she took team gold and individual silver. If she adds to her Olympic medal collection in Brazil then she will exceed the nine-medal target set by Anky van Grunsven (NED) during her spectacular career. Anky van Grunsven also holds the record for taking three back-to-back Olympic titles – at Sydney (AUS) in 2000, Athens (GRE) in 2004 and Hong Kong (CHN) in 2008. 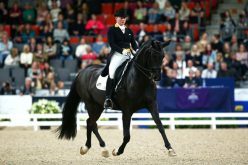 In the history of Olympic Dressage, Germany has dominated the medal tables, taking 12 team and seven individual titles. There will be three separate competitions – Grand Prix, Grand Prix Special and Freestyle to Music. The Dressage Grand Prix takes place on Wednesday 10 and Thursday 11 August followed by the Grand Prix Special on Friday 12 August. The Grand Prix Freestyle will bring the Dressage discipline to a close on Monday 15 August. The Team medals will be decided after the first two competitions – the Grand Prix and Grand Prix Special – when the scores are combined. The Freestyle will decide the fate of the individual medals. Dressage Ground Jury President is Mexico’s Maribel Alonso and the remaining members of the panel are Gary Rockwell (USA), Stephen Clarke (GBR), Eddy de Wolff van Westerrode (NED), Peter Holler (GER), Thomas Lang (AUT) and Susanne Baarup (DEN). The Judges Supervisory Panel (JSP), was introduced by the FEI in 2011 to provide an official back-up system to correct marking errors at all major events, including Olympic Games. The JSP also evaluates the quality of work of leading Dressage judges, assists in selection of those officiating at the top end of the sport and acts as a link between judges and the FEI. The members of the JSP at the Rio 2016 Olympic Games are Mary Seefried (AUS), David Hunt (GBR) and Uwe Mechlem (GER). FEI Delegate for Dressage is Belgium’s Jacques van Daele. Dressage Chief Steward is Elisabeth Williams, who will be assisted by fellow-American Lisa Gorretta. Australia: Mary Hanna (Boogie Woogie 6), Kelly Layne (UdonP), Kristy Oatley (Du Soleil), Lyndal Oatley (Sandro Boy). Reserve: Susanne Hearn (Remmington). Brazil: Luiza Tavares de Almeida (Vendeval 4), Giovana Prado Pasa (Zingaro de Lyw), Joao Victor Marcari Oliva (Xama Dos Pinhais), Pedro Manuel Tavares de Almeida (Xaparro Do Vouga). Reserve: Manuel Rodrigues Tavares de Almeida Neto (Vinheste). Denmark: Anna Kasprzak (Donperignon), Agnete Kirk Thinggaard (Jojo AZ), Cathrine Dufour (Cassidy), Anders Dahl (Selten HW). France: Stephanie Brieussel (Amorak), Ludovic Henry (After You), Karen Tebar (Don Luis), Pierre Voila (Badinda Altana), Alexandre Ayache (Axel). 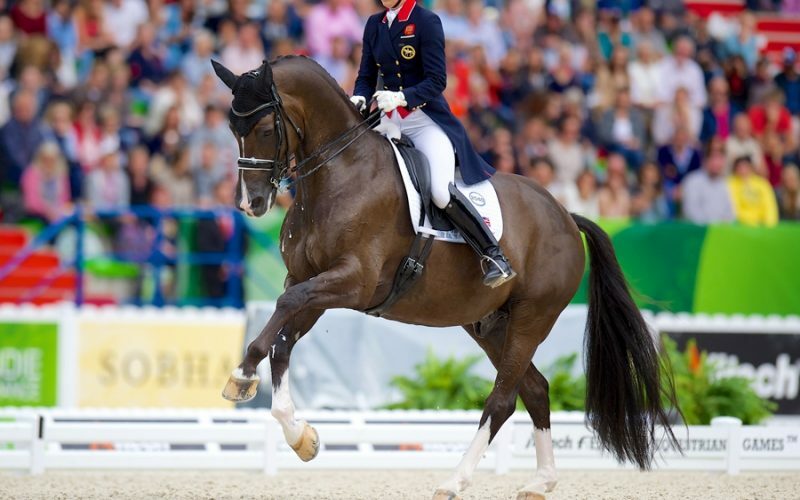 Great Britain: Fiona Bigwood (Orthilla), Charlotte Dujardin (Valegro), Carl Hester (Nip Tuck), Spencer Wilton (Super Nova ll). Reserve: Lara Griffith (Rubin Al Asad). Germany: Kristina Broring-Sprehe (Desperados FRH), Sönke Rothenberger (Cosmo), Dorothee Schneider (Showtime FRH), Isabell Werth (Weihegold OLD). Reserve: Hubertus Schmidt (Imperio). Japan: Kilchi Harada (Egistar), Yuko Kitail (Don Lorean), Akane Kuroki (Toots), Masanao Takahashi (Fabriano 58). Netherlands: Adelinde Cornelissen (Parzival), Edward Gal (Voice), Hans Peter Minderhoud (Johnson), Diederik van Silfhout (Arlando). Reserve: Madeleine Witte-Vrees (Cennin). Spain: Claudio Castilla Ruiz (Alcaide), Beatriz Ferrer-Salat (Delgado), Severo Jesus Jurado Lopez (Lorenzo), Jose Daniel Martin Dockx (Grandioso). Reserve: Borja Carrascoa (Wonder). Sweden: Patrik Kittel (Deja), Juliette Ramel (Buriel KH), Therese Nilshagen (Dante Weltino), Tinne Vilhelmson Silfven (Don Auriello). Reserve: Mads Hendelowitz (Jimmie Choo). USA: Steffen Peters (Legolas 92), Laura Graves (Verdades), Kasey Perry-Glass (Dublet), Alison Brock (Rosevelt). Reserve: Shelly Francis (Doktor). Austria: Victoria Max-Theurer (Della Cavaleria). Canada: Belinda Trussel (Anton), Megan Lane (Caravella). Dominican Republic: Yvonne Losos de Muniz (Focoloco W). Ireland: Judy Reynolds (Vancouver K). New Zealand: Julie Brougham (Vom Feinstein). Republic of South Africa: Tanya Seymour (Ramoneur 6). Russia: Inessa Merkulova (Mister X), Marina Aframeeva (Vosk). Switzerland: Marcela Krinke Susmelj (Molberg). Australia, Austria, Belgium, Brazil, Canada, Denmark, Dominican Republic, France, Great Britain, Germany, Ireland, Italy, Japan, Korea, Mexico, Netherlands, New Zealand, Palestine, Republic of South Africa, Russia, Spain, Sweden, Switzerland, Ukraine, USA.